You are here:HomeBlog[FAR Schools]: Supporter Lynn Nakashian Meets with Beneficiaries at the Gavar Guest House. [FAR Schools]: Supporter Lynn Nakashian Meets with Beneficiaries at the Gavar Guest House. Once again it was an honor to meet with FAR supporter Lynn Nakashian. Ms. Nakashian, who was in Armenia to volunteer with the Fuller Center for Housing, also took time to visit the Girls Apartment in Gavar, which is part of the Gavar Guest House, a facility that provides temporary housing to children transitioning out of Gavar Orphanage. The Girls Apartment was recently renovated due to the generous support of the Nakashian family. Currently, four individuals – Sveta Antonyan, 19, Sona Qocharyan, 18, Marianna Hakobyan, 18, and Aida Asirbabyan, 18 – peacefully and comfortably share the apartment. Ms. Nakashian and her friends, also volunteers at the Fuller Center, met with the girls and spent some time at the apartment. The girls shared their stories and any concerns they have about the apartment’s facilities. It was a real surprise for Ms. Nakashian to learn that three of the girls have successfully passed their entrance exams and have been admitted to Gavar State University’s Philology Department. This is genuine proof that the Nakashian family is helping to provide life-changing support that will enable these young women to further pursue careers and more become active members of Armenian society. After listening to the stories of these young women, Ms. Nakashian expressed willingness for her family to further support the Girls Apartment in Gavar. 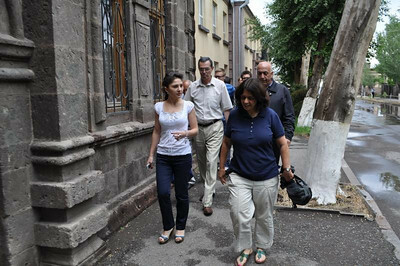 visited the Girls Apartment in Gavar during a her trip to Armenia. 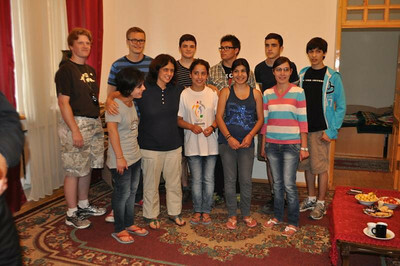 Lynn Nakashian with some of the residents of the Gavar Guest House.